The St. Peters Rec-Plex will be the focal point of the roller hockey world. State Wars 14, the U.S. Roller Hockey Championships, will be held there for the third time in seven years. More than 3,000 roller hockey players and 12,000 other attendees will come to St. Peters for the annual tournament from July 25 to Aug. 6. The Rec-Plex also hosted State Wars 8 in 2012 and State Wars 11 in 2015. Roller hockey (also known as inline hockey) teams are composed of up to four lines of players including two forwards and two defensemen on each line. There are five players including the goalie from each side on the rink at a time. Inline hockey is a very fast paced and free-flowing game because it does not have the same rules as ice hockey. There are no blue lines or defensive zones in roller hockey, unlike ice hockey. It means that, according to most rule codes, there are no offsides or icings that can occur during gameplay; this along with fewer players on the rink allows for faster play. There are traditionally two 20-minute periods or four 10-minute periods with a stopped clock. The Rec-Plex’s three ice rinks will be turned into inline skating rinks for State Wars 14 as teams from all over North America and the world, including teams from the United Kingdom, South Korea, Sweden, France, Brazil, Argentina, and Colombia, will be in town. With the mix of state and international teams, players and fans alike will be amped up even more. The influx of players and family members for this event could potentially add several million dollars to the local economy. One of the highlights of the tournament will be the Pama Pro Invitational that runs on July 27-29. The 12 best professional teams will mix it up with the winner-take-all prize of $25,000. The Rec-Plex is used to putting on significant events. The Missouri State High School Athletic Association has long hosted both boys and girls state swimming and diving championships there as well as its state water polo tournament. But few, if any, match the impact State Wars has. It will be easy to check out all of the action as State Wars 14 is open to the public is free. Events will take place at all three rinks: Rec-Plex North Rink (600 seats), Rec-Plex South Rink A arena (1,200 seats) and Rec-Plex South Rink B (300 portable seats). To accommodate State Wars 14, public ice skating sessions will be unavailable through Aug. 27. The ice will be melted, and rinks converted for inline hockey surfaces brought in special for State Wars. After the event, the ice rinks will undergo maintenance for a few weeks. Learn more about the United States Roller Hockey Championships, including the upcoming schedule and watch live games streamed for free online, visit www.statewarshockey.com. 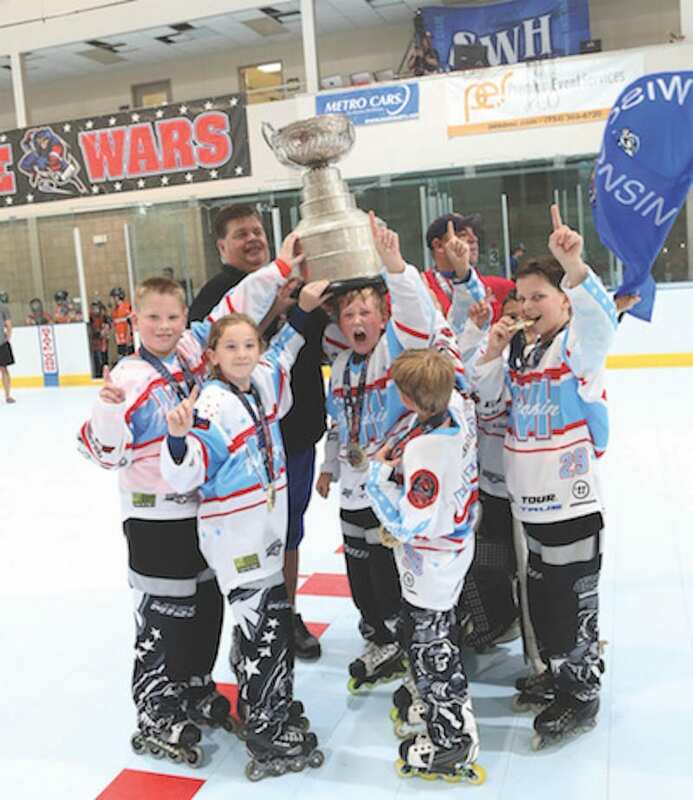 CUTLINE: Submitted photos 346 teams from six-and-under to adult will compete in State Wars 14, the U.S. Roller Hockey Championships, held at The St. Peters Rec-Plex from July 25 to Aug. 6.